N.B Plugs and Bushing are not identified by Pressure Class. They may be used for rating up through Pressure Class 6000. * This table is not intended to restrict the use of pipe of thinner or thicker wall with fittings. Pipe actually used may be thinner or thicker in nominal wall than that shown in table. When thinner pipe is used its strength may govern the rating. 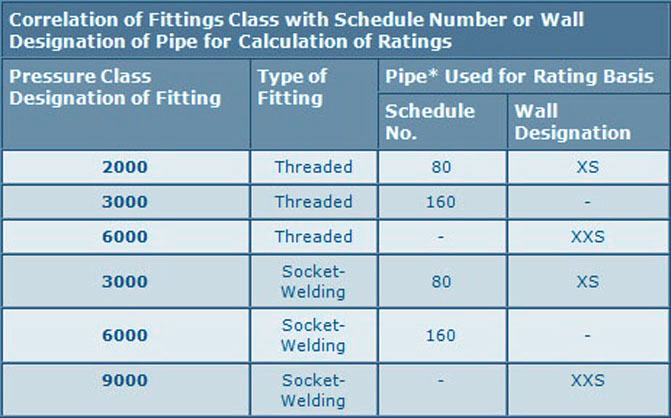 When thicker pipe is used (eg., for mechanical strength) the strength of the fitting governs the rating. Note: If a material is not listed, it does not mean that it is unavailable.